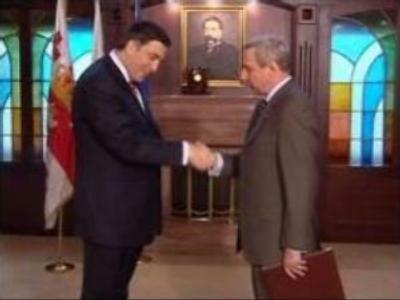 Russia's ambassador to Georgia Vyacheslav Kovalenko has presented his credentials to the country's president. The Ambassador is positive that his return is a sign of improving relations. The bilateral relations were badly rocked in September over the arrest of 4 Russian servicemen Georgia accused of spying. “It is impossible to underestimate the importance of our friendship and partnership. We've noticed there are less rhetorical comments and more sense between us and we are ready to start talks again,” stressed Mikhail Saakashvili. For his part, the head of the Russian diplomatic mission explained the hard work was just beginning. “Right now the best thing is to regain the trust for one another, so in the future both sides would have no problems existing together,” Vyacheslav Kovalenko said. He also expressed his concern over the recent uranium smuggling scandal, when a Russian man was convicted of uranium smuggling and sentenced to 8 years in jail. Russia believes the case involved political postering. “It has to be a fair game, not just for us. However, lately we witnessed the uranium smuggling scandal, allegedly from our territory to Georgia. The Russian side thinks things like this do not help in improving relations,” said Mr Kovalenko. Georgia, though, is sure the case has nothing to do with politics. “I can only repeat that we do not want to speculate on this issue. That was not a political issue, and it goes beyond bilateral relations. It is the issue of international security and safety,” stated Georgia's foreign minister Gela Bezhuashvili.